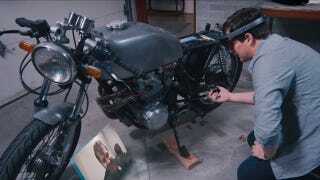 Microsoft showed off a new faceputer today, and while I could quibble about the real-world usability of strapping a honking piece of plastic to your head or the misuse of the word "hologram", I'm way more intrigued with the possibility of someone telling me how I'm screwing up my suspension rebuild in real-time. HoloLens looks like the closest thing we've come to a really immersive augmented reality experience. It's not like Google Glass because it covers your entire field of view and it's not like the Oculus Rift because it's transparent, allowing you to see the world around you. Because of that, Microsoft can overlay anything in your line of sight and let you control it through gestures, eye-tracking, voice, and even a virtual mouse. So far, Microsoft is showing the kind of things you'd expect, like playing a game on your coffee table, watching TV without actually needing a TV, and taking a quick walk on Mars. But for gearheads there's a lot more potential. One of the demos our compatriots at Gizmodo got was a lesson on wiring a light switch. They dialed up Skype, shared their view with the person on the other end, and were walked through the wiring complete with drawings of what need to go where, all controlled by the person on the other end of the line. It's similar to what Jason imagined using Google Glass for nearly two years ago, but unlike Glass, which relied on a tiny little screen to show information, HoloLens covers your entire field of view. Pop your hood or prop up your bike's fuel tank and you could have an overlay pointing out all the different components, what tools you need, how to remove them, and how to put them back. Even better, it could show you what's obscured from view – like x-ray vision – and warn you about drilling through that high-voltage line. For that to work, manufacturers would need to import and convert all their documentation into the appropriate format, similar to what Boeing did back in the 90s. But for a hapless garage mechanic like your's truly, the possibility of calling up my carb guru and having him walk me through a new tuning would be pretty amazing. But we're still a ways out. Microsoft isn't saying if or when the HoloLens is coming to market, and based on Giz's experience, they've got some kinks to work out.